Am I in my novel? No. I have heard that if you get famous enough to be interviewed in the media, you may be asked if any of your characters is yourself. My answer is a very clear 'no', that is, none of the protagonists or villains is me (or anyone else I know, I have a vivid imagination, which is the only reason to write a book!). But I do have a strong fellow-feeling for a very minor character who appears in the Cretan section: the short-sighted scribe. I have been appallingly myopic all my life, such that were there no corrective lenses available, I could be registered blind. So I wrote that scribe as a flight of fancy, wondering how someone like me might have survived in the pre-spectacles world. I actually wrote more about her than I could let into the novel, or it would have been far too long. But if I ever hear that readers would like to read the fuller piece, (and find out her name, which had to be taken from her in the book), I will post it here. So, let me know! I'm not as short-sighted now, having grown 'very early' cataracts, had them removed a year or two ago, and replaced with correcting lenses. So now I wear my glasses on the inside! I was left just a little myopic, so I can read 'bare-eyed', or at least will be able to once a cloudy capsule is removed. I can't wait, it will be great to read again without cloudy blurs floating across the print. Despite the Angels is now $2.99, which is cheaper than its original price, so it's still good value. I am having very good reaction from people who have bought the book from me -in other words, my personal contacts.... Well, you could say 'but they would, wouldn't they? ', but that's not entirely true, I have long experience in amateur drama and all the ways of saying "I didn't like it much" without actually saying it. So I am taking it as encouraging when people who didn't have to say anything, said a lot. Thank you all!! 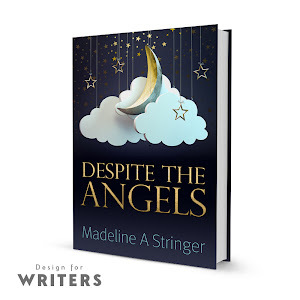 This year I will publish its sister book, not a sequel but in the same genre.So it would be really great if all my blog followers would tell me what the best genre for Despite the Angels is. Thanks. And a HAPPY NEW YEAR everyone! 99 cents for two more days! Whew! The book is launched and I am wrecked.... Partly from standing all evening in much higher heels than I'm used to, in the effort to look nice, and partly through major cooking and preparation for the event. I overestimated the numbers, so I've lots of crisps over(not a problem, I've a birthday coming up) and a good deal of the wine. Most of the other food, some brought by my daughter Rachel and my friend Jane, was gobbled up by a wonderful crowd of friends and acquaintances. The book was launched by Victoria Mary Clarke and John Joyce, both introduced by my husband (no problem to him, a life in amateur drama and toastmasters helped out!) The talks were about as different as two talks could be - Victoria, who has written about contacting her own angels, 'channelled' them for us and we were given warm messages of encouragement; then John gave a very clear run-down of what is required to get a book out there - art,craft and graft. Goodness, is he right! Then I gave a short speech of thanks to everyone who ever helped, read a piece from my book and then a description of the meaning of the plaster angels in the Unitarian Church, and then we played the 'book trailer' video. That was when the roving microphone's batteries died, so as I hadn't thought to bring speakers, we were holding the laptop as near to the fixed mic as we could! There were a few laughs, so someone must have been able to hear! Sales were brisk, my great son Andrew (watch this space for his forthcoming zombie novel...) was salesman, and each book was given to its new owner in a bag printed "authl.it/h8", so friends can easily find it online; and most exciting, one guest works in Sweny's Chemist, of James Joyce fame, and he will be stocking the book. So Dubliners: hurry down to Lincoln Place to secure your signed copy! Pictures were taken by my 'official photographer' best friend Jane. Sorry, I was told a few days ago that Saturday is double-booked in the Unitarian Church, so I have had to re-arrange my book launch party to FRIDAY 27th SEPTEMBER. The date is fixed, we all get together to celebrate the launch of "Despite the Angels" on Saturday 28th September in the Unitarian Church, St.Stephen's Green, Dublin, at 7pm. Lots of drinks and nibbles, some short speeches, I hope a showing of "A Frustrated Angel", lots of chat and fun, maybe even some music. And of course, paperbacks on sale for €10, with some discounts for bulk purchases. If you are in Dublin, come along and introduce yourself! I know there are loads of people out there who would love to read this book, and I am doing all I can to let them hear of it. If you know of anyone who would like to be 'in the loop', please spread the word!! I'm Madeline Ann, and my day job is as a homeopath/ hypnotherapist/Bowen technique therapist, and also I do womens' medicine. But I really like writing and generally playing with words. Have been writing on and off for "more years than I care to remember" as we say in Dublin, but a medical training is a great way to stifle that sort of creativity so I only got back into it properly in the last 8 years or so, when George, my definitely better half put a line through Mondays in my appointment book and said 'you are writing on Mondays and getting that book Finished'. So I did, and here I am! I am a member of the 'Dalkey Writers' Workshop', 16 writers who meet fortnightly to read and critique each other's work. In November 2011 we published 'Circle Time', an anthology of our work, which contains five of my pieces, three poems and two in prose.